Start airbrushing now with the Neo Series for Iwata. The best airbrush in the market for the first-time user, the Neo is very affordable and reliable — and it's backed by an unprecedented five-year warranty. 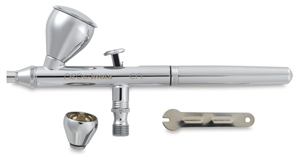 These versatile, value-priced airbrushes can be used with a variety of different paints and mediums. Designed to perform well at lower pressures when used with smaller air compressors, they're also easy to use and clean. Neo for Iwata TRN2 Side Feed, Trigger Airbrush — Same as the Neo BCN Airbrush above, but with a trigger handle. Also comes with 1/4 oz and 1/2 oz side feed color cups. Neo for Iwata TRN1 Gravity Feed, Trigger Airbrush — Same as the Neo CN Airbrush above, but with a trigger handle. Neo for Iwata CN Gravity Feed, Dual-Action Airbrush with Two Cup Sizes — This airbrush features a 0.35 mm needle-and-nozzle combination for fine to medium spray performance. It includes interchangeable large (1/3 oz or 9.9 ml) and medium (1/16 oz or 1.8 ml) cups that are designed with a funnel shape, allowing for easy cleanup and more efficient paint flow. The airbrush holds 1/32 oz (0.9 ml) of paint without a cup attached. It's a great airbrush for small to medium sized projects. Neo for Iwata BCN Siphon Feed, Dual-Action Airbrush — This airbrush features a 0.50 mm needle-and-nozzle combination for high-performance, general-purpose, high paint-flow spraying and wider spray patterns. It includes a 1 oz (30 ml) Big Mouth bottle.